I am having difficulty wrapping my brain around the point of the expression vs the code block. What am I suppose to be defining? I copied the example from calculate value in the ArcGIS help website almost verbatim and yet it says my definition is wrong. More specifically it says a syntax error in line 1. In your code block you are defining a function, in your expression you are calling that function. Your function needs to specify new variable names that are used within the function, and you pass the field names to those variables. The function variables should have new unique names, not the same values you are passing in your expression. So here you are passing the value from !Z_score! 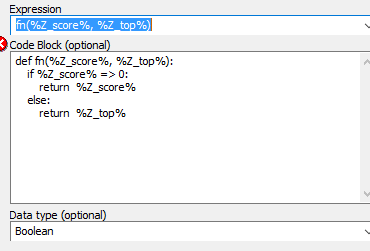 to your function into a variable called zs, and the value from !Z_top! into zt. Those values are then used in the function. And as commented by Michael Stimson, leave the Data Type as blank as Boolean is unlikely to be the correct value. Not the answer you're looking for? Browse other questions tagged arcgis-desktop modelbuilder python-parser expression terminology or ask your own question. Avoiding error 000539 from code block in Calculate Value tool? Using UNC pathname with Calculate Field tool in ArcPy? Python script in ArcMap Field Calculator giving Error 000539: SyntaxError: Invalid Syntax? Fixing address errors using Python Parser of ArcGIS Field Calculator? ArcMap field calculator error 000989 indention error? Converting VB codeblock to Python in ArcGIS Field Calculator?